This is the best cookie that you'll ever eat. IF you make it, that is. This is also the most time consuming cookie that you'll ever eat, but OH, is it ever worth it. And no, these are NOT the same as what you buy in the store. This, my friends, is a little taste of heaven. In a large bowl, mix together flour, egg yolks, cold water, sugar and salt. Roll out dough on a heavily floured board to a rectangle, 10 x 12 inches. The dough will be very sticky at this point, and it is difficult to work with. Spread 1/3 of the can of Crisco on the dough. and then the other side, so that the dough is folded in thirds. Now fold the dough in thirds the opposite way. Place the dough on a heavily floured plate, and cover well with plastic wrap. Refrigerate for 1/2 hour. After the half hour rest, roll your dough back out to another rectangle. Spread another 1/3 of the can of Crisco. The dough is easier to work with now. Fold the same way, cover, and refrigerate again. Do this one more time with the final 1/3 of Crisco. While your dough is resting, prepare your clothespins. The old fashioned kind without a spring. Wrap them in aluminum foil, and spray them with Pam. After the third addition of Crisco, and letting it rest in the refrigerator for another half hour, cut the dough into thirds. Cut each third into six pieces, making 18 pieces in all. Keep the dough that is not being worked in the refrigerator. Roll out one piece of dough at a time. The dough must be very thin, about 1/8 of an inch. Cut dough in 3/4 inch wide strips. Wrap each strip loosely around a clothespin, overlapping the dough slightly. Bake on ungreased cookie sheets at 425 F for 5 minutes. Reduce heat to 350 F, and bake 10 minutes longer. Carefully remove shells from the clothespins. The shells are flaky and fragile, but so... good! Cool and fill. Beat margarine and Crisco. Add sugar and cold milk. Beat well. Add vanilla and almond flavorings. Beat. Place filling into a pastry bag, and pipe into shells. These look very similar to something that Mostly Muffins out of Seattle makes. They call them "World's Best Cookies." And yes, they are oh-so-delicious. Yummy! Icant wait to try these! I've been looking for the recipe that uses crisco rollked in the dough. 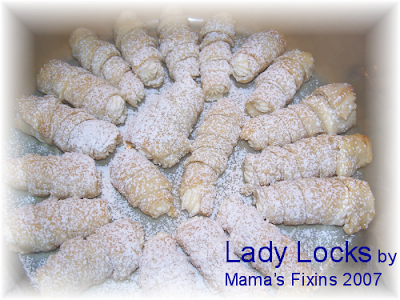 My ladylock recipe is basic flour, butter and sour cream. I WANT FLAKY LADYLOCKS!!! I will b making these this weekend/ Thank You!! Hi Kristen, Sorry for the delay in getting back to you. I've not had any problems with the recipe, but I wonder if you might try making it with Walmart brand shortening, but not the all vegetable shortening. They make one that has lard in it too.